BadCreditLoans.com Review (2019) - "Are They #1 for Bad Credit?" BadCreditLoans.com works to connect people with bad credit to loans tailored specifically to their current credit situation. Its large network of lenders is available to you 24/7/365 — no matter what you need the money for. Having been in business since 1998, BadCreditLoans.com is one of the leading lender networks in the subprime space today. In a Nutshell: Since 1998, Bad Credit Loans has been connecting people with poor credit to the funds they need when they need them the most. Though not a lender itself, Bad Credit Loans acts as an advocate for consumers and matches them with a web of lenders willing to provide no-obligation offers. The site’s comprehensive news section alerting consumers to the latest scams, best practices on rebuilding and taking out lines of credit, and a host of other offerings make Bad Credit Loans a valuable resource for those seeking funds in times of need. Emergency financial situations always seem to come at the worst times. And for those with bad credit, the stress of getting a personal loan to make ends meet can be severe. Unfortunately, dealing with poor credit is a more pervasive problem than some might expect. According to the Corporation for Enterprise Development (CFED), 51% of Americans have credit rankings that dip below the subprime range. What’s more, having no credit history can be as much a hindrance as having bad credit. The CFED also reported, “26 million U.S. adults were credit invisible…[and] an additional 19 million adults were unscorable.” Never having created a history with the credit reporting agencies or having a low credit score usually works to disqualify a consumer from opening lines of credit — a seemingly paradoxical problem to have. However, a poor credit score or a short credit history doesn’t mean there are no options available. It’s just a matter of knowing what resources are out there. Bad Credit Loans offers a simple and convenient way for these millions of Americans to have access to the funds they need. 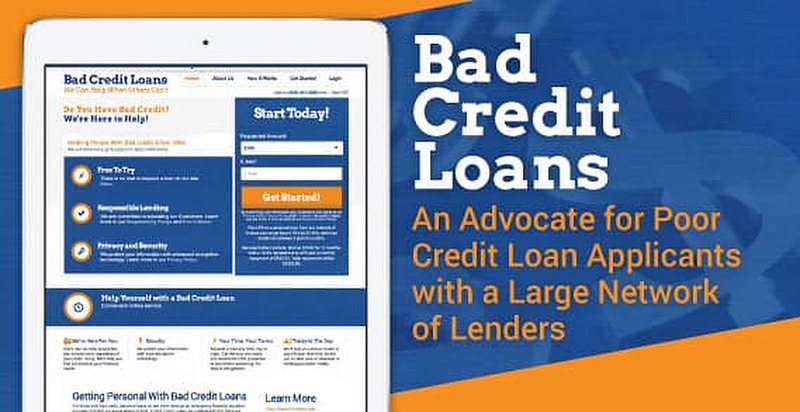 Whether it be for personal, business, credit card, mortgage, or auto loans, Bad Credit Loans connects consumers with a network of reputable lenders. Built around a mission of responsible lending and consumer advocacy, the site is a storehouse of resources for those in financial need.